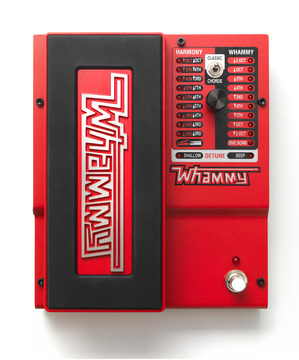 The Digitech Whammy pedal is legendary for it's pitch shifting sounds, the new for 2012 5th generation model does classic Whammy sounds and is also POLYPHONIC! Classic Whammy sound: The classic Whammy sound remains the same. Chordal Whammy pitch-shifting: The Whammy now comes equipped with the ability to select chordal pitch-shifting to shift an entire chord using the latest pitch-shifting technologies and algorithms. True Bypass: We’ve added true bypass to eliminate any coloring of your tone when the Whammy is not in use. MIDI input : MIDI Control gives you remote access to all Whammy functions while leaving the pedal offstage in a rack. 9V DC power adapter included, works anywhere, comes with USA and Euro style plugs.